From left: Datin Linda Ngiam, Housing and Local Goverment Minister Datuk Seri Kong Cho Ha, Star Publications (M) Bhd group chief editor Datuk Seri Wong Chun Wai and executive deputy chairman Datuk Clement Hii at the official launch of Star Property Fair KL at Menara Star on Sept 29. PETALING JAYA: Developers in the Klang Valley are planning to launch more projects in the coming months as the local property market continues its recovery. To provide industry players a platform to showcase their latest developments, The Star Media Group will be organising the first Star Property Fair in Kuala Lumpur from Nov 27 to 29. Themed “Stylish Living”, The Star Property Fair Kuala Lumpur will be held at the KL Convention Centre halls 4 and 5. According to Star Publications (M) Bhd group managing director and chief executive officer Datin Linda Ngiam, the economic downturn has affected the property market and there is a need for an integrated platform for property developers and prospective purchasers to meet. “The Star Property Fair is an integrated platform because it will be an on ground event fully supported by our print, radio, magazine and online media, especially StarProperty portal. “Through the property fair, we hope to complement the Government’s efforts in stimulating the economy especially in the property market and hasten the process of recovery. Businesses such as financial and lifestyle will subsequently benefit also,” Ngiam said. The Star has so far organised eight annual property fairs in Penang and response from both exhibitors and visitors has been very encouraging, making it the leading property fair in Penang. “With our established network and the strategic platform created over the years, we want to leverage on our position as a leading media group to set a new benchmark for property exhibitions in the country,” she added. Ngiam said many affluent Malaysians were looking to invest in properties that would not only give them good long-term value but also reflect on their lifestyles. The upcoming fair will enable visitors to view the latest offerings by renowned local developers for a broad range of property from medium to medium high-range residences, luxurious bungalows to exclusive condominiums, and commercial projects. Visitors will also have the opportunity to obtain advice on financing options from participating financial institutions as well as government agencies that will be on hand to offer information on Employees’ Provident Fund withdrawals and on other matters. There will also be talks and forums conducted by industry experts on various topics, including property investment, feng shui and home inspirations. Other attractions include auctions by CIMB Property Mart and a contest for all visitors to the fair with prizes worth over RM20,000 to be won. The property fair is open to the public from 11am to 8pm (Friday to Sunday) and admission is free. For enquiries on the property fair, contact Kenny Thong or Ian Qua at 03-79671692 or 79671388 ext 1165. PETALING JAYA: When the International Real Estate Federation (Fiabci) organises its annual Malaysia Property Award (MPA), it usually coins a tagline to convey the theme for the year. Last year’s awards emphasised environmental consciousness while this year’s focus is on Intrinsic Value in Holistic Living. If these themes are meant to be an indication of the ideal Malaysian property development, or the direction that local developers should be heading, than Mulpha International Bhd’s Pinggiran Bayou Village Homes is certainly ahead of its time. The winner in the best residential development (low rise) category at the 2007 MPA, the luxury resort homes are redolent of environmental splendour and holistic ambiance. Being a countryside development, holistic living meant its residents could interact with nature as much as possible, said Mulpha general manager (property division) Ronn Yong. “Holistic living is about the surrounding experience. A lot of developers ignore the well-being of the nature around their development. When they finish constructing, they wash their hands and just walk off,” he told StarBiz. Pinggiran Bayou Village Homes is an exclusive enclave of 122 two-storey homes that are part of the company’s 1,765-acre Leisure Farm Resort located in Gelang Patah, Johor and next to the Second Link Expressway to Singapore. The homes have wide frontages with double volume living and dining rooms, enhanced with internal courtyards, skylights or roof decks and screened outdoor gardens. The low density of 10 to 12 units per acre also lines a waterway and fronts an expansive Canal Park. “We wanted our residents to be able to enjoy the sights, sounds, fragrances and feel the wonders of living with nature,” Yong said. Epitomising a “green” architecture concept, the philosophy behind the development is aimed at protecting, preserving, recycling and conserving as much of the natural resources and surroundings as possible. Prior to construction, the company took great pains to ensure the impact on the surrounding ecosystem was minimal, Yong said. “We photo-document our sites prior to construction, which means that we record and study the wildlife within the area, like the birds. This is so that we would know if any wildlife was affected upon the project completion. We also expand progressively so that the impact on the surrounding nature is minimal and not too drastic,” he said. About 70% of the homes have been taken up. Residents are a mix of locals, Singaporeans and other expatriates. The homes are priced from RM500,000. Only the bumiputra units are left, but Mulpha is in no rush to sell off these units, according to Yong. “We often rent out these units during the weekends. During festive seasons like Hari Raya, all the available units are fully booked. They’re quite popular because people enjoy the peace and tranquility there,” he said. The Pinggiran Bayou homes went on to win the 2008 International Prix d’Excellence Award for best residential category – and a string of other accolades. Yong said winning a Fiabci award helped create more recognition for not just the Pinggiran homes, but also the entire Leisure Farm development, which has a gross development value of over RM2bil. “It (winning) has also helped build the confidence levels of our architects, consultants, contractors and others who helped develop the project,” he said. The MPA has been heralded as the “Oscars” of the local property industry. Fiabci Malaysia will be organising the 2009 MPA on Nov 16 in Kuala Lumpur, with Malayan Banking Bhd as the official sponsor. The categories that will be contested are: Property CEO of the Year, Master Plan, Residential Development (low rise and high rise), Retail Development, Office Development and Purpose-Built Project. KUALA LUMPUR will have to wait a little bit longer for its first Four Seasons hotel as the developer for the RM2.5 billion project may get a new partner. "There is an internal restructuring to the shareholding structure of Venus Assets Sdn Bhd," a source said. A search with the Companies Commission of Malay sia reveals that Venus Assets is owned by Venus Pacific Sdn Bhd. Venus Pacific is 30 per cent owned by ISY Equity Sdn Bhd, a company controlled by Tan Sri Syed Yusof Syed Nasir and the Sultan of Selangor while 70 per cent is held by Attesa Investment Ltd, a firm controlled by Ipoh-born tycoon Ong Beng Seng and partner. There would also be minor changes to the 65-storey building that comprises a hotel, apartments and a retail area, the source added. Venus Assets bought the prime 1.05ha site, which sits right next to the Petronas Twin Towers, for RM90 million in 2003 from the estate of the late Khoo Teck Puat, the former major shareholder of Standard Chartered plc. The source said that the Four Seasons Place project will take off but the timing has not been confirmed. The project was first announced in 2005, but piling work only began in 2007. Said to be the tallest Four Seasons in the world, the project has already been plagued with several delays, ranging from changes in building plans from an initial two tower project to a single tower. There were also changes in design, positioning, composition and roping in of partners for the venture. In an interview with Business Times in March this year, Syed Yusof said contractors will be hired in the third quarter of 2009. However, it is understood that this has yet to happen. In the same interview, he also said the completed Four Seasons Place will have 150,000 sq ft of retail space, 150 hotel rooms and 100 serviced apartments. There will also be another 140 units of apartments that will be sold. The cost of construction for all components including land and interior design is RM1.4 billion while the estimated gross development value of the project is RM2.5 billion. IREKA Corp Bhd’s growth driver may come from either a real estate investment trust (REIT) or expansion of its development management services to other property markets. Until it finalises its options, the construction group is now on an asset-light operations mode, keeping its balance sheet lean, its executive director Lai Voon Hon told Business Times recently. Incorporated in 1967 by Lai Siew Wah, Lai’s father, Ireka’s core businesses are construction, property development, hospitality & leisure and information technology. It is not looking for new business opportunities for now but does not discount the possibility of launching a REIT when the time is right. Its current asset-light business model was adopted when Ireka was restructured to cut its gearing after the 1997 financial crisis. It shed its weight among others by listing in London Aseana Properties Ltd where it holds a 23 per cent stake. It also sold The Westin Kuala Lumpur to an international investment firm and its entire property portfolio to Aseana to focus on construction. The de-gearing move was also to diversify risks, Lai said. Under the asset-light model, Ireka, through its wholly-owned unit Ireka Development Management (IDM) Sdn Bhd, is responsible for implementing the real estate investment strategy for Aseana. IDM’s role as a development manager includes engaging, managing and coordinating third parties in relation to the development or management of properties and leading the negotiation for the acquisition, disposal or financing of real estate assets. On plans to go international, Lai said Ireka will remain focused on Malaysia and Vietnam, where it is exploring infrastructure-related projects. According to Lai, there is still a lack of high quality housing, offices, shopping malls, hospitals and hotels in Vietnam. 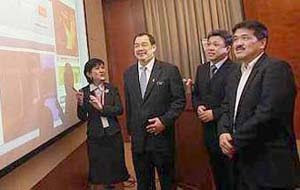 Lai said he believes Vietnam will remain a high growth market post the global financial crisis. “All the positive economic fundamentals, which had attracted foreign investors to Vietnam in the past, remain intact and will be the foundation for future growth once the global economy recover,” he said. Lai, however, did not rule out the possibility of looking into other Asian countries in the future. IREKA Corp Bhd's construction arm, Ireka Engineering & Construction (IEC) Sdn Bhd, will remain the biggest contributor to its net profit and revenue going forward, executive director Lai Voon Hon said. Ireka, set up in 1967, is involved in construction, property development, hospitality & leisure, and information technology. IEC has three projects in hand, namely SENI Mont' Kiara and one Mont' Kiara in Kuala Lumpur and Sandakan Harbour Square with outstanding works of RM650 million. It may get more jobs next year as Ireka has been pre-qualified to bid for more than RM2.5 billion worth of infrastructure and building construction projects. Ireka started as Syarikat Lai Siew Wah, a sole proprietor which undertakes general earthworks such as site clearing and road work construction for other local contractors. The group, founded by Lai's father, Lai Siew Wah, expanded its fleet of plants and machinery and began to take on large-scale construction works in the 1970s. Throughout the 1990s it had constructed some notable projects like the Kuala Lumpur International Airport runway, sections of the Kuala Lumpur Middle-Ring Road II and North-South Expressway, Putrajaya government administrative offices and The Westin Kuala Lumpur. The elder Lai is a self-made man who learnt through the school of hard knocks. At the age of 10, he was laden with responsibilities far too big for his age. There was no formal schooling and he had to contribute to the family's income due to the passing of his father. He became a machine repair apprentice and at 14, wanted to own a tractor. With the money earned, he bought a machine and leased it out, gradually moving into sub-contracting work. Siew Wah, now 69, is known in Kuala Lumpur as 'lai wong' (earth king). His son, a professional architect, joined Ireka in 1994 as the group general manager and was appointed to the board in 1996. KUALA LUMPUR: SUNRISE BHD's net profit rose 24% to RM37.3 million from RM30.2 million a year ago as earnings were sustained by progress billings for its ongoing developments. The company said today that pre-tax profit rose 17% to RM50.2 million from RM42.8 million while revenue was RM190.3 million compared with RM198.2 million a year ago. Earnings per share were 7.52 sen versus 6.37 sen a year earlier. "The company's earnings continue to be sustained by progress billings for our ongoing developments, namely 10 Mont'Kiara, 11 Mont'Kiara and Solaris Dutamas, as well as sales of 11 Mont'Kiara and the completed Mont'Kiara Residence bungalows. The y-o-y growth in profitability was also driven by lower operating costs," it said. Sunrise said the strong sales momentum continued into the quarter, with the company chalking up RM147 million in sale-and-purchase-agreement-signed sales. As for sentiment for property, the company said it was boosted by the global economic recovery, low interest rates and the global stock market rally. Providing an update on its projects, Sunrise said construction of ongoing projects was progressing well. Solaris Dutamas and 10 Mont'Kiara are due for completion in the current financial year and 11 Mont'Kiara in 2011. It said Solaris Dutamas, its first integrated commercial-residential development, would transform the Dutamas area into an engaging and lively hub. Sunrise added the development, targeted for completion in stages up to mid-2010, would house an exciting differentiated retail offering which will open in end-2010. "Going forward, the company has substantial unbilled sales of RM870 million as at Sept 30, which will sustain earnings in the current and following financial year," it added. Sunrise plans to launch several new residential and commercial projects in the near future in order to sustain longer-term profits. Its first and final dividend of three sen per share for financial year 2009 was approved by shareholders at the AGM on Oct 29 and would be paid on Dec 10. At the AGM, shareholders voted favourably on the company's "Say on Pay" proposal. Sunrise said the proposal, a first for corporate Malaysia, underscored its commitment to corporate governance and shareholder accountability. BERJAYA Hotels & Resorts, the leisure arm of Berjaya Land Bhd, will spend close to RM130 million to refurbish its six hotels in the country, says its chief. The company operates the Berjaya Langkawi Resort, the Berjaya Tioman Resort, the Berjaya Redang Resort, the Berjaya Georgetown Hotel in Penang, Colmar Tropicale in Bukit Tinggi, Pahang and the Berjaya Times Square Hotel in Kuala Lumpur. Chief executive officer Joseph Won said despite the current economic downturn, the properties have generally maintained its revenue per available room. The four-star properties recorded an average occupancy rate of 66 per cent for the financial year ended April 30 2009. Won said he is expecting more visitors to Langkawi, Redang and Tioman next year, as the economy improves and the company embarks on promoting its properties aggressively. "Malaysia is a beautiful country and it has a lot to offer but it needs to be more focused in promoting local tourism in a more controlled and organised fashion. "Malaysia needs a roadmap so that all players, including the government, will have something more firm to look at and follow," Won said. 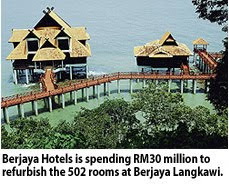 Won said Berjaya Hotels is spending RM30 million to refurbish the 502 rooms at Berjaya Langkawi. It will spend another RM25 million in the second or third quarter of 2010 to improve the public areas at the resort. "We have been refurbishing the rooms since August. We want to improve the appeal of our resort so it could compete more effectively," Won told Business Times in an interview. Berjaya Hotels will also spend RM70 million to upgrade its 670-room Berjaya Times Square Hotel, the company's best-performing city hotel, beginning first quarter of 2011. At the same time, the company will conduct minor renovation at the Berjaya Redang Resort. It will spend some RM7 million to refurbish the two food outlets, after spending RM35 million to upgrade its 220 rooms last year. "We are proud of Berjaya Redang. The average room rate during the peak period is RM550 and due to high level of demand for rooms during this season, we are looking to raise the rates next year," Won said. SINGAPORE: CapitaLand Ltd, Southeast Asia’s largest developer, is seeking S$2.8 billion (RM6.8 billion) from the listing of its CapitaMalls Asia Ltd unit as it seeks to grow its retail mall business across the region. Some 1.2 billion shares were being offered at S$1.98 to S$2.39 apiece, according to emails sent to investors by sale arrangers Credit Suisse Group AG and Deutsche Bank AG. The share sale will be the biggest in Singapore this year, according to data tracked by Bloomberg. The listing of CapitaMalls Asia will give investors access to a company that manages 86 retail Properties across Asia, including China. The company’s net asset value is estimated at about S$5.3 billion as of Sept 30, according to a prospectus filed with Singapore’s central bank today. CapitaLand has gained 13% since it announced plans to list the unit on Oct 5. The Singapore benchmark Straits Times Index has added 1.5% in the period. DUBAI: Dubai Holding's chief executive officer (CEO) has taken the helm of its property unit, the company said yesterday, after the division's chairman was ordered by a Dubai watchdog to face questioning over suspected wrongdoings. Yesterday, an official at Dubai's financial audit department confirmed a report in state-owned newspaper Emarat Alyoum last Thursday that it questioned Hashim al-Dabal, chairman of Dubai Properties, over what it called financial irregularities. Dubai Holding declined to comment when asked about the allegations. Its CEO Ahmad bin Byat, who was named acting chairman of the property unit, could not be reached for comment. Dubai Holding reorganised its business into four groups in August: property, business parks, hospitality and investments, in a bid to deal with the economic crisis.